Hi everyone, I hope this is the right place for my post. I am from Australia, but will be visiting Plovdiv between 01/11/2016 and 04/11/2016 (also visiting Sofia too). I have read through this forum for information to plan my journey including from this thread: http://forum.gtsofia.info/index.php?topic=7397.0. Unfortunately I don't know any Bulgarian, so a bit difficult understanding other threads, but I try my best! I also want to do a day trip from Plovdiv. Ideally want to find some old MB O305 or MAN SL200 buses. Which place would have the best success? From what I read, Sliven and Yambol have some of these buses and are about 3 hours away by train/bus from Plovdiv. I'm not sure if the bus/train times online are correct though. Any suggestions on the best place to visit to find older O305/SL200 or similar buses and how to get there? Sliven and Yambol seem to be the best places to find old MB O305 buses. You can reach both cities by train or bus. The train schedule is available on BDZ website: http://www.bdz.bg/en/. The bus schedule is available here: http://www.avtogara-plovdiv.info/. Buses to Sliven depart from Bus station South (Автогара Юг) at 7:00; 7:30; 11:00; 12:00; 14:30; 16:30; 17:00. There is only one bus to Yambol at 5PM so better take the train. Visiting Sofia is a must, many MB O305/G/Heuliez buses are still in service there. If you find it difficult to ask, I can ask for you. I would also suggest visiting Blagoevgrad. The fleet there is very varied, from old Ikarus and Chavdar buses, to newer MAN NL202 and many other bus types bought second hand from Western Europe. If you have any question, feel free to ask. You can also contact me on PM. I am from Plovdiv and I believe I'll be available on the specified dates to give you a tour around the city if you want. I've also visited Yambol and I can also give you very detailed information about how to reach Yambol, where to go, etc. and might have the opportunity to join you for your trip to there, again.. if you want. Due to constant road-work in the city, bus routes are changing constantly - on rare occasions a few times a day. There is a map of the bus routes but are currently incorrect due to the specified reason. I will try finding a detailed one tomorrow. Specific busses use to operate on certain routes, but often some break down or are transfered for a short time to another line. Overall - every day you can see different things on bus routes. 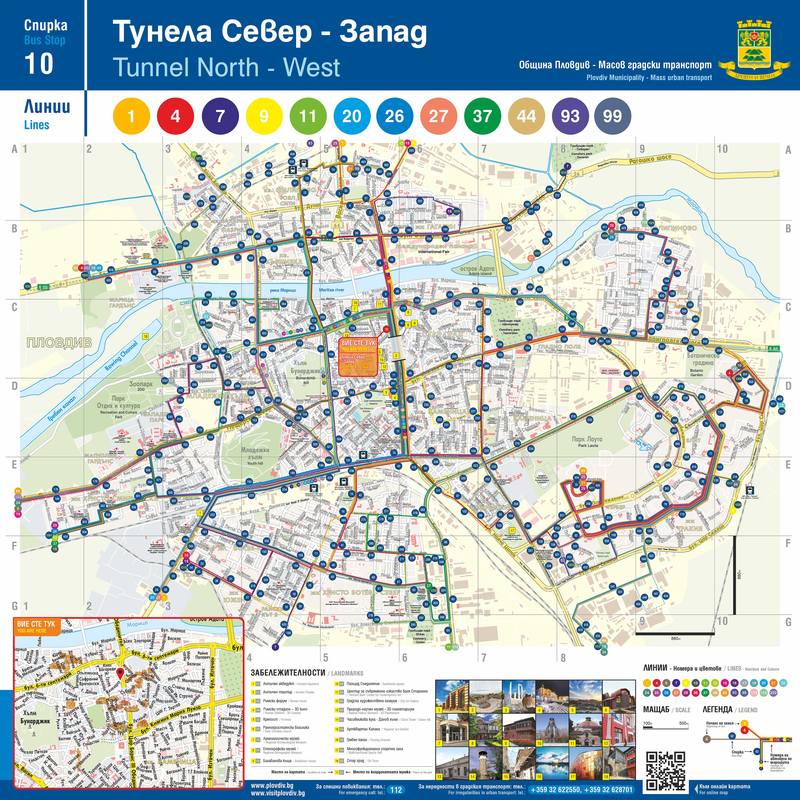 Also, if you have any specific questions about Plovdiv's transportation system, feel free ti ask me. I believe I can give you information about everything going on in Plovdiv. The train schedule is available on BDZ website: http://www.bdz.bg/en/. Note: In the timetable Yambol is spelled as "Jambol". Thank you Sofia and PorscheBulgaria for your help and thank you for the train/bus timetables. I think Yambol has more O305s, but Sliven from what I read is more picturesque. I'm not sure how easy it would be to fit both into one days travel from Plovdiv. It seems from Plovdiv, train timings are better for Yambol and bus timings for Sliven. Do you know the last return bus time Sliven-Plovdiv? And are there regular buses between Yambol and Sliven in case I try to visit both? I will be visiting Sofia for a few days before and indeed will be flying out of Sofia after visiting Plovdiv. I also visited Sofia in August 2013 and loved seeing all the O305s there. I guess there is much less now. My hometown in Australia got rid of their last O305/Gs in 2013 after 34 years of service. I don't think I will have time to visit Varna. It's a bit too far away from my planned destinations, thanks for the suggestion though. Blagoevgrad sounds interesting and is only 2 hours from Sofia, maybe I can squeeze a day trip in from Sofia. Otherwise, since I am arriving from Skopje, I could go via Blagoevgrad and stay the night. Do you know of any buses that can get me from Skopje to Blagoevgrad? Blagoevgrad to Sofia looks easy but maybe it might be more difficult from Skopje. Yes PorscheBulgaria if you are available, it would be nice seeing the city and Plovdiv buses from a local perspective for a change. Likewise with my possible day trip to Yambol and/or Sliven. We can discuss by PM. I see about the roadworks. If you do find any information on the bus lines or network, that would be great for navigating. Here is the route network map and some quick things to have in mind about it. First, it's an example map, one that you would find on the bus stops and will have different information on it depending on where you are. In general, the upper part of this map will be different so don't pay too much attention to it for now. Second, notice the bottom right corner of the map. It shows all the bus routes and their respective colors (for easy navigating the map). Have in mind that our routes don't have A and B letters that let you know which direction is it going (like in other countries and cities). The route number is the same no matter what direction the bus is heading. Locals are used to it, but it's difficult for visitors to navigate around. Third, only the dark blue circles correspond to the bus stop numbers. They usually consist of 3 numbers inside them, but there are some with 4, which represent the last stop of the bus. Some routes pass through such 4 digit stops, although they are not last stops for them, but for other routes. Fourth, since I don't notice directions on this particular map, let me write them down: North corresponds to the upper part of the map, south is to the bottom, west and east are to the left and right respectively. Finally, click on the map to enlarge it. It is possible to fit Yambol and Sliven in one day, although it won't be easy. The last bus from Sliven to Plovdiv departs at 19:50, before that there are buses at 16:00 and 16:45. Buses from Yambol to Sliven depart every 30 minutes and the trip takes 45 minutes. If you are arriving from Skopje this is a great opportunity to visit Blagoevgrad. However I think that there is no direct bus from Skopje to Blagoevgrad. You can take a bus from Skopje to Sofia (departs 8:30 and 15:00) and change in Kyustendil on a bus or train to Blagoevgrad. Another possibility is bus (or train) from Skopje to Veles and from Veles there is a direct bus to Blagoevgrad (departs 7:00). It's easy to get from Blagoevgrad to Sofia as there are many buses and trains, about every 30 minutes or so. If you go to Blagoevgrad, don't forget to visit Varosha architecture complex. Also, if you have some time it's worth visiting Rila monastery on the way to Sofia. Thank you. Your write up is very well written and understandable. The map will be very handy for planning any trips or locations to take photos of buses in Plovdiv. By the upper part, do you mean north of the river? My occupation involves planning bus/train networks and schedules, so I guess I can find it easier to navigate most foreign cities easier than many people would. Do you know how frequent the local Plovdiv bus lines are? Is there timetables/schedules, or do they come regularly enough? Yes I think I will try to do this. Probably too early to get from Skopje to Veles on the same day for 7:00, so do you know how often the bus/train is between Kyustendil and Blagoevgrad? I can catch the 8:30 bus from Skopje (I caught this one back in 2013 too) and hopefully connect at Kyustendil for service to Blagoevgrad. Easy way to fit Rila Monastery in too. I will need to calculate and adjust my plans as I had not considered Blagoevgrad before your suggestion. Do you know if the local buses in Blagoevgrad still run on weekends or would it be better to visit on a weekday? Thank you so much both for your very helpful advice and knowledge. I really appreciate it. I think these are the last questions I have for now. I don't want to hassle too much as sometimes it's more fun to find out when you arrive, but I also like being prepared too. By the "upper part of the map" I meant to say the "image" - above where the map actually ends and where the colorized circles with the route numbers are and the bus stop name is on the white and blue background respectively. That part of the image is specific for each bus stop and this is why I advised not paying attention to this for now because if might confuse you to think those are all the routes in the city while they are not. As for locations to photograph busses, I've been taking photos of busses for nearly two years in Plovdiv and I pretty much know all the best locations for the job. I am talking specifically for bus front and door-side, lit by the sun, expositions. I can make you a map (using the above one) of all the best locations with information about the best time (incl. optimal time intervals to stay) to go there and achieve the example exposition I am talking about. It will take me some time though, but I would like to do it just in case I can't join you for the tour. I will look into optimal and quick transportation from Plovdiv-Yambol-Sliven and suggest you a route plan for this specific trip later this week. Buses from Kyustendil to Blagoevgrad depart at 10.00, 13.00, 15.45 and 18.25. You can also take the train, but it's painfully slow between Kyustendil and Radomir and the train is not direct so there is at least 1 transfer at Radomir. By the way, while you are waiting for the bus in Kyustendil you can take a stroll in the city center, visit the Uspenie Bogorodichno church, the Roman therms and the Roman ruins in the city center. St. George medieval church, Vladimir Dimitrov gallery and Hisarlaka fortress are also worth visiting, but they take a lot of time so I guess that a walk in the center will be more than enough to kill some time. Buses in Blagoevgrad travel on weekends as well but on longer intervals so it's usually best to visit on weekdays. One of the depots can also be visited. Contact the colleague Sixkiller, he's from Blagoevgrad and he can give you more information. Or I can contact him for you if you have any questions. Keep in mind that the bus terminates at Ovcha kupel bus station and not Sofia central bus station. Also a piece of advice when traveling with Sofia public transport. To spare yourself unpleasant experiences, always travel with a valid ticket (if it's a paper ticket bought from a kiosk or from the driver don't forget to "validate" it using the punching machines in the vehicles). Ticket inspectors target foreigners because they are seen as easy victims. Do not trust what the inspectors are telling you because they are often lying and don't succumb to their threats. Don't fear to argue with them and even call the police if necessary. If you need to pay a fine, under no circumstances pay in other currency rather than Bulgarian lev. The fine is currently 40 leva (and not 40 euro). Inspectors often try to mislead foreigners that the fine is 40 euro. Also after paying the fine they must give you a red ticket with 40.00 лв. written on it. If they don't give you a ticket thеn they are trying to keep the money for themselves. PorscheBulgaria I see what you mean now, thanks. That's good, it sounds like we are likeminded with photography. I also have a preference for nearside (front and door-side) shots evenly lit for best composure. You don't need to go to all that effort with a map, but I appreciate your assistance if you do anyway. Hopefully there is sun during my visit and that it is not raining or overcast! I will be interested to see your plan for a visit to Yambol and Sliven from Plovdiv. Thanks Sofia. If I catch the 8:30 bus from Skopje, unless there are problems at the border or with the bus, I will surely make the 13:00 from Kyustendil. I'm just not sure, but will the Sofia bus drop off at the same location of the bus for Blagoevgrad? Maybe I might have problems if there are not many english speaking people in the town if I have to navigate to somewhere different. But at least the wait is not too bad if I miss it. I can look around, maybe I'll find some old buses there too! With that in mind, I will try to reach Blagoevgrad on Friday afternoon (28/10), but I will have to work it out first. Daylight savings ends on the same weekend, so luckily got extra time in the evening for photos if I am late into Blagoevgrad! Yes, a depot visit would be nice if it can be accommodated while I'm in Blagoevgrad. Thanks too for the information on the Rila buses. Thank you for the advice for Sofia public transport. I remember being checked once by ticket inspectors on my last visit, however luckily my ticket was valid. I was worried they may find an excuse to say it is not valid. 4th option: Delcevo - Blagoevgrad: 15:00 and 06:00. 3rd and 4th option are good if you could rech Delcevo or Strumica. However i think Skopie - Sofia - Blagoevgrad will be the best option for you. Also if you are interested, check bus company ALPAR Turizm / Domino line Skopje - they travel from Skopje to Istanbul but also there is direct bus from Istanbul to Blagoevgrad so i think they make a transfer in Sofia. Ask them if you could travel from Skopje to Blagoevgrad directly (that trip will probably be during the night because the bus arrives from Istanbul (20:30 leaves) in Blagoevgrad at 06:30-07:00 on the next morning). From Blagoevgrad to Plovdiv there are buses at 06:20 (passes through Belitsa, Yakoruda, Velingrad - a picturesque route) and arrives in Plovdiv around 11:50. Other option is 06:30 (passes through Dupnitsa, Samokov, Pazardjik. Also there is other bus at 14:00 (passes through Borovetz ski-resort, Medilin SD company) and 17:30 (bus to Istanbul - company Alpar/Matpu-96). There's no Mercedes O305/G or MAN SL200 in service in Varna. However i think Skopie - Sofia - Blagoevgrad will be the best option for you. Best option is Skopje - Kyustendil - Blagoevgrad. No need to go all the way to Sofia. Thank you everyone for your comments. So grateful for the assistance. Sixkiller thanks for the list of options. I think I will take the option Skopje (08:30) - Kyustendil (15:00 dep) - Blagoevgrad. This fits in with my plans and timing is better than the other options. I have done the trip Skopje - Sofia before, so something slightly different will make it more interesting. Perhaps my only worry at Kyustendil is being a small town, if there is an ATM or money exchange so that I can get BGN currency to use for the next bus trip. Hopefully it should be ok.
Are you able to help with any information on the buses within Blagoevgrad? For example, the bus lines or a network map? How to ride the buses, tickets? Also Sofia mentions about being able to visit one of the depots. Do you know how this can be done or what I should do to arrange? Maybe PM is better way to discuss? So at this stage, the Bulgarian part of my trip will consist of Blagoevgrad (and Rila) - Sofia - Plovdiv (and Yambol/Sliven) - Sofia. I am looking forward to it! Perhaps my only worry at Kyustendil is being a small town, if there is an ATM or money exchange so that I can get BGN currency to use for the next bus trip. Hopefully it should be ok.
Don't worry, there are ATM's in Kyustendil, also there are banks in the city. Are you able to help with any information on the buses within Blagoevgrad? For example, the bus lines or a network map? How to ride the buses, tickets? At afternoon the lines reverse their operators - 1 and 3 are operated by Ikarus, 2 is operated by new buses. But always there should be at least one Ikarus in service. You are free to explore the whole depot, seen at the pictures on the link. It is the last stop of bus line 2. You buy your tickets from the conductor inside the bus, no need to purchase a ticket in advice. Sadly, there is no day card, so you have to pay the price of 0.80lv (0.40 euros cents) for every single trip. Thank you for this information. Does this operation of old Ikarus and Chavdar buses also apply on Saturday and Sunday? Is there any map of these three bus lines? I'd like to find some spots to take photos hopefully. So I presume the depot is open and they don't mind if people walk through? That is good if so. Most bus depots in Australia are heavily secured and monitored by CCTV. No, no CCTV at all - rarely someone might look at you strangely or surprisedly but nothing more. I will try to make a map for you these days because right now there are only old maps available but they are not good. I will send you more info via PM these days.